COAHOMA - The Bulldogettes came back from a 8-point deficit and almost forced a fourth set in their district opener against Jim Ned Saturday before the Lady Indians sealed the match 27-25. Overall, Jim Ned swept Coahoma in three sets: 25-12, 25-9, 27-25. After dominating the first and second games, the Lady Indians looked ready to wrap up the win in the third as they racked up the score to 9-1. 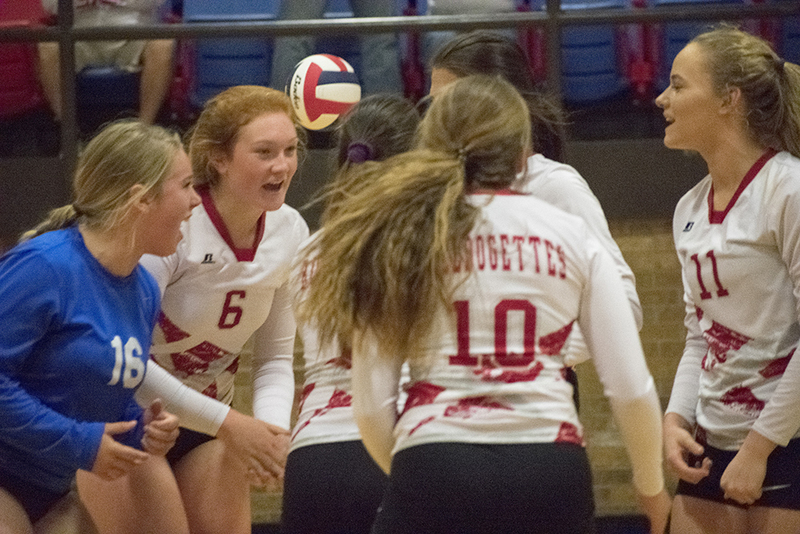 Although the Bulldoggettes slowly chipped away at the deficit, the Lady Indians were not in a very giving mood. By mid-match, the score was 14-7 in favor of Jim Ned. Then Cailtyn Corley smacked down a kill shot by Jim Ned at the net energizing the Bulldogette team, who went on a 4-point run. The Bulldogettes found their footing from there with some aggressive play forcing the Lady Indians to defense several times. A kill by Kirah Kimbell sent the ball back to Coahoma’s side 2 points away for a tie which came when MaKynlee Overton blocked a shot by the Lady Indians leaving the set 20-all. It was the first of four times Coahoma tied the game. From then on it was an all out fight between the two teams with a number of long rallies to energize and entertain the crowd. With Paige Atkins serving, the Bulldogettes took the lead 25-24 but their momentum was cut short in the next serve after two Lady Indians decisively knocked down a shot from Coahoma at the net. Jim Ned put the game away in the next two serves. Akins led Coahoma on kills knocking out 7 during the game. Julia Mashburn had 9 assists and Grant had 8 digs. Earlier in the day, both Coahoma JV teams fell to Jim Ned. JV White lost 25-17, 28-26 and JV Red lost 25-16, 25-20. Next: Coahoma heads to Colorado City Saturday, Sept. 29. The JV Red team will play at 11 a.m. and the varsity game begins at noon.